Dr. Mitchell Sojack is a Licensed Clinical Social Worker (L.C.S.W) who specializes in mental health and behavioral science (Ph. D). By the time we met him, he had already been in practice in the Fredericksburg area in Virginia for nearly three decades and worked mostly out of his home. Dr. Mitchell’s patients consist mostly of children and adolescents who experience anxiety, depression, and suicidal tendencies. These are kids either in middle or high school. Occasionally, he also gets kids younger than middle school age and young adults in college. His private practice was doing fairly well but was restricted to the immediate local area and was mostly marketed by word of mouth by his loyal clients. He was looking to expand his reach beyond Fredericksburg and appeal to larger audience. Dr. Sojack didn’t have a website for his practice. He had never had one and didn’t know where to begin. Dr. Mitchell was a bit old school in the sense that he had begun his practice and flourished long before the internet age truly caught up in the world of medicine. As a result, he had been putting it off for a while. However, as his market began to reach saturation and he intended to expand his operations to a larger area than his hometown in Virginia, the importance of the internet became apparent. At first, Dr. Sojack didn’t know where to start. He knew he wanted a website where people could easily book appointments with him, but he didn’t have very clear ideas about how it should look, including the theme and color scheme. With him, we weren’t going to do the usual facelift on an old and struggling website. We had to start from scratch and build something remarkable from the ground up. For us, it was both a significant challenge and a wonderful opportunity. Our first batch of suggestions had to do with the design of the look and feel of the website. Luckily, Dr. Sojack’s private practice already had a business card with a logo and some kind of color scheme. It was centered on blue and green, and that is what we suggested the website’s color scheme should be. We also suggested that Dr. Sojack run a blog on the website. If he was going to establish credibility, he had to show people he was an authority first. Here, our idea was to advertise his experience and qualifications. Meanwhile, we would put in of Calls-to-Action (CTAs) around the site so that as soon as people arrived they would see how easy it is to set up and appointment with Dr. Sojack. The site structure would also be optimized to encourage visitors to hang around a little longer and explore, discovering everything Dr. Sojack had to offer in the process. Our short-term goal was to design the basic site in WordPress and work on making it as SEO friendly and responsive as we could. A responsive web design was necessary and good site and URL structure made sure the search engines could crawl it and index it. We also placed CTAs appropriately on the home page and a few other pages to encourage visitors to set up appointments. The long-term goal was to build site authority by having an active blog where informative, interesting, and authoritative articles would be located. The onus for this was on Dr. Sojack himself as he was the authority behind the website so only he could write the articles. We, however, showed him how to do keyword research and optimize each article for SEO purposes. The first part was simple enough: we did a wireframe of the suggested design elements and showed it to Dr. Sojack. He would ask for edits, which we would immediately implement. As the wireframe slowly evolved, the picture of Dr. Sojack’s dream website slowly began to become clearer and, by the end of the initial design process, he knew exactly what kind of website he wanted to be built. As soon as we had a concrete idea of what Dr. Sojack wanted, the design team got to work, frequently communicating with the doctor about the work as it moved along. Dr. Sojack was also provided with a link through which he could remotely watch the website’s progress. The whole job was completed in 4 weeks. 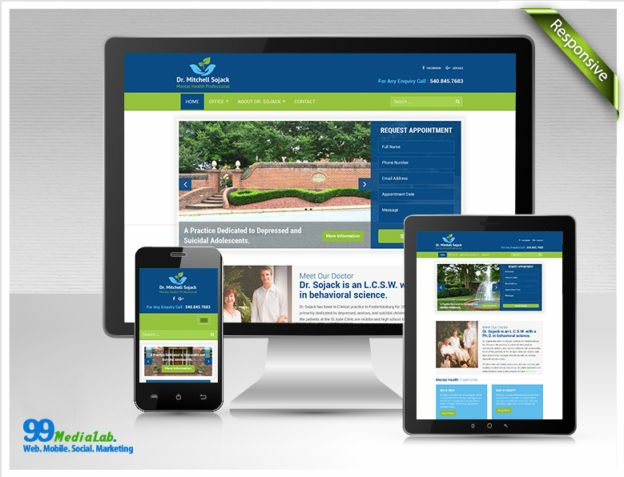 The website was a gradual success after it was launched and Dr. Sojack’s practice attracted more clients. Needless to say, the client was happy with our service.